Ya’ll know I like pink and red, right? So naturally I would like both of these. In fact, the red clutch is an absolute must. $150 well spent if you ask me. But go pick your own color, there are plenty for everyone. Those flats just scream Spring!! You are so right about those clutches! Eyeing the blue one…and pink flats…love! I could really go for that clutch! I’ve been in love with those clutches they are so so gorgeous and such a good price point! That clutch IS pretty amazing!! Love the red clutch! I would probably go for a basic colour, but the bold ones are so fun! Both of those are great for Spring! Loving the color combo! Love that clutch; it will add the perfect pop of color to any outfit! And I heart pink & red too… perfection. 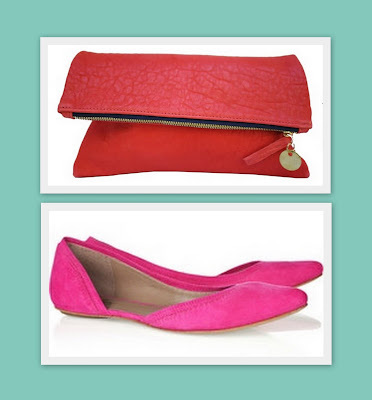 Pink and red is one of my all time favourite combinations- love love both of these pieces. Ah love both, but those flats are screaming my name! I hope they are comfy! I must find a pair to try them on. Great color combo to work all the way through summer! Ohh great find. I’ll take the pink and cobalt ones! Love this clutch and shoe combo. They go perfect with your blog too! i absolutely love clare vivier! The orange clutch is really doing it for me! Love the clutch. Thank you for posting it. I can’t wait to order one. Those pink flats were born to be on your feet. The clutch is great too, I kind of really love the bright blue one too! Oh la la. You can’t go wrong with a red clutch or pink shoes!! Love these!